Up on the EUR-Lex, the European Union’s database on laws, regulations, publications and reports is a staff working paper ‘Measuring progress towards circular economy in the European Union – Key indicators for a monitoring framework’ meant as accompanying background text for a ‘Communication from the Commission to the European Parliament, the Council, the European Economic and Social Committee and the Committee of the Regions on a monitoring framework for the circular economy’. 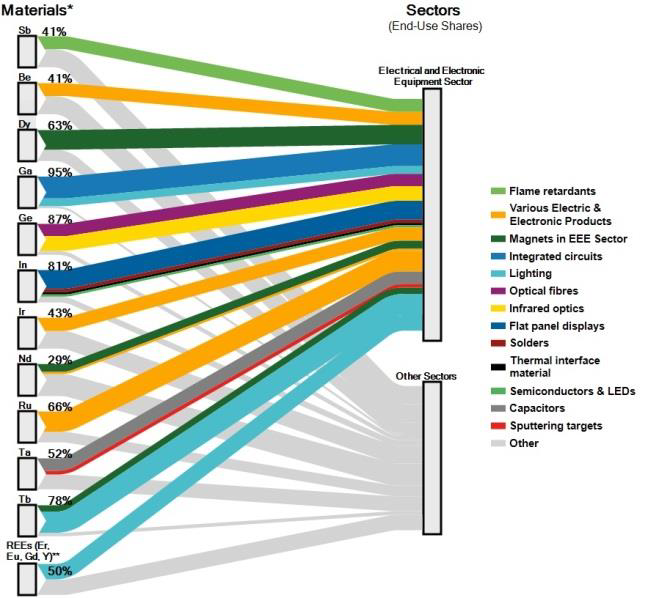 And it shows this beautiful Sankey diagram on material flows in the EU economy (2014). Flows are in Gt/yr (billion tons per year. The composition of the flows is presented at certain points in the diagram as bar charts on top of the dark blue bands: metal ores, non-metallic minerals, fossil energy materials/carriers and biomass. For each of those four groups individual Sankey diagrams can also be found in the working paper. The EU never stops to surprise me! In this case in a positive way, as Sankey diagrams seem to have arrived at the top echelons of European policy making (or at least with their staff). Another example for a Sankey diagram on a map from an article ‘Exergoecology Assessment of Mineral Exports from Latin America: Beyond a Tonnage Perspective’ by Jose-Luis Palacios (Escuela Politécnica Nacional, Quito, Ecuador) et al. published in Sustainability 2018, 10(3), 723 as open access article distributed under Creative Commons Attribution (CC BY) license. Exergoecology is the application of the exergy analysis in the evaluation of natural fluxes and resources on earth. The consumption of natural resources implies destruction of organized systems and dispersion, which is in fact generation of entropy or exergy destruction. This is why the exergy analysis can describe perfectly the degradation of natural capital. The authors of the article argue that the Material Flow Analysis (MFA) approach should be combined with a measure for the thermodynamic quality of minerals, “especially when dealing with non-fuel minerals”. They propose to use the indicator exergy replacement costs (ERC) from exergoecology because it “considers the scarcity degree of the commodities in the crust and the energy required to extract them. When a mineral is scarcer and its extraction and beneficiation processes are more difficult, its ERC value becomes higher”. 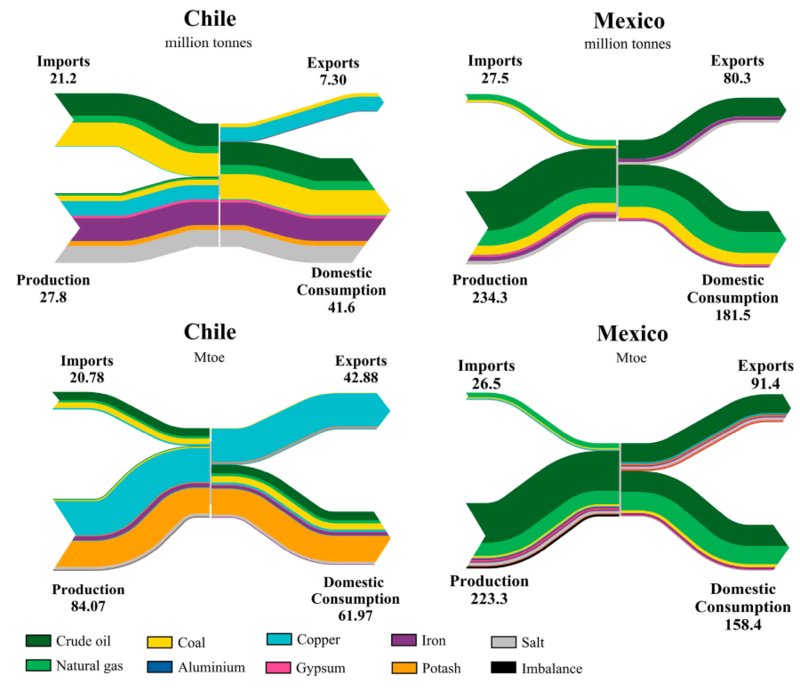 The two Sankey diagrams on the left are for Chile, the two on the right for Mexico. The figure at the top is a common mass-based figure, showing minerals production, imports, domestic consumption and exports for certain minerals. The unit of measure is million tonnes per year (in 2013). The one at the bottom shows exergy replacement costs (ERC) measured in million tonnes of oil equivalent (Mtoe). For each mineral an energy indicator in GJ per tonne of element has been applied, representing the work (energy) to extract the mineral. In the case of Chile we can see for example that iron, copper and salt are the minerals mined in largest quantities (mass-wise). However, iron and salt only make up a small fraction of ERC, while copper and potash dominate the picture. In other words: Potash has a high exergy replacement cost to produce given the work effort required to mine it and in face of its scarcity. Copper comes in second. For Mexico the figure a the top and below look pretty similar in regard to the proportions of each of the colored flows. One could say that the minerals are similarly difficult or expensive to extract. Coal (yellow band) is comparatively wider in the mass flow diagram than in the exergy replacement costs diagram, so it is “cheaper” in regard to exergy cost to be mined. Many more interesting details to discover and the article is well worth reading. In my oponion a fascinating blend of two approaches and a great use for Sankey diagrams. Europe’s Joint Research Centre (JRC) has published a new report on ‘Critical Raw Materials and the Circular Economy’ in December 2017. 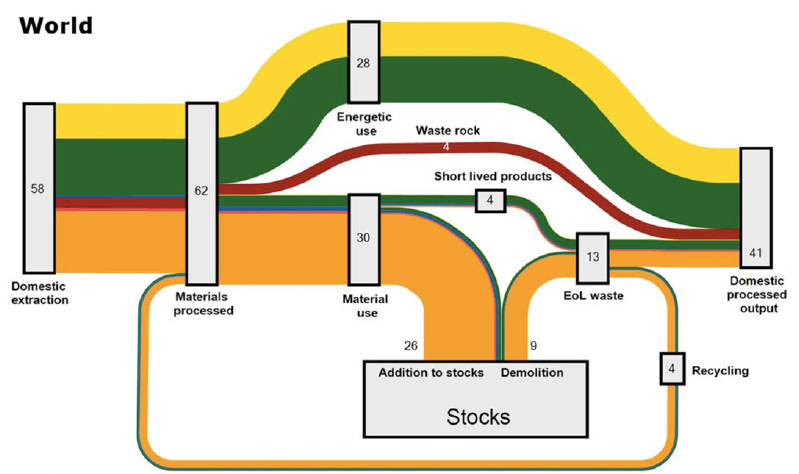 The report also builds on findings from a 2015 study by BIO by Deloitte, where a Raw Material System Analysis (MSA) Framework had been introduced that “investigates the flows and stocks of 28 raw materials from ‘cradle-to-grave’, that is, across the entire material life cycle from resource extraction to materials processing to manufacturing and fabrication to use and then to collection, processing, and disposal/recycling”. I had posted about this here. 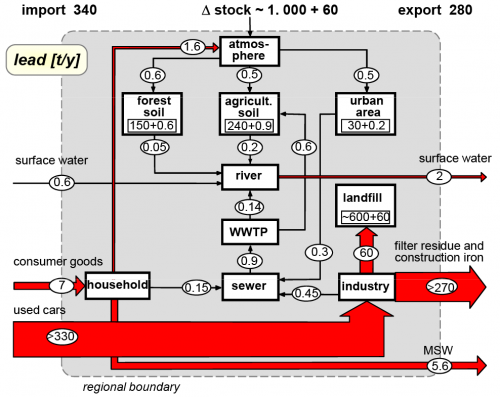 Like in the 2015 study the authors present MSAs for a number of critical materials (CRMs) within the EU-28 boundaries and are depicting them as Sankey diagrams. The authors then expand into how scarcity and price may impact certain industrial sectors or products (Automative, Electronics, Batteries, etc.). Best practices are suggested for recovering critical materials. All flows are in kilograms per the reference year 2012. We can see that roughly 80.000 kg of Germanium entered the EU in the year 2012, and 15.800 kg were made available on the secondary material market within the EU. For the individual industrial sectors, another type of figure is presented. This breakdown of how much of the CRMs is used in a specific sector gives a better understanding of the dependency on certain CRMs. 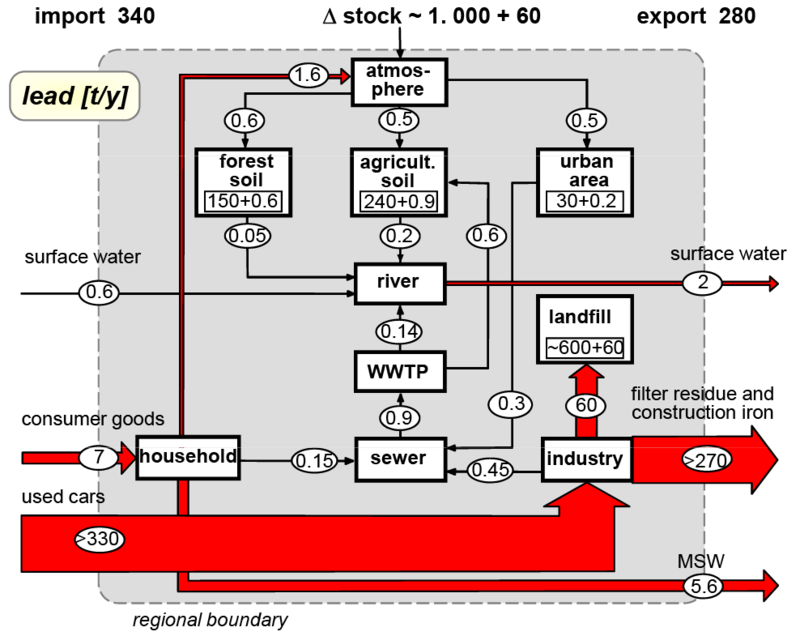 Crossing the information from the MSA Sankey diagams that show availability of a CRM, and the information from the Sankey diagram showing demands per sector gives a good understanding on why some materials are considered critical for industries, and measures for recovering more of them from tailings or waste are meaningful. Source: Mathieux, F., Ardente, F., Bobba, S., Nuss, P., Blengini, G., Alves Dias, P., Blagoeva, D., Torres De Matos, C., Wittmer, D., Pavel, C., Hamor, T., Saveyn, H., Gawlik, B., Orveillon, G., Huygens, D., Garbarino, E., Tzimas, E., Bouraoui, F. and Solar, S., Critical Raw Materials and the Circular Economy – Background report. JRC Science-for-policy report, EUR 28832 EN, Publications Office of the European Union, Luxembourg, 2017, ISBN 978-92-79-74282-8 doi:10.2760/378123 JRC108710. Access JRC report here (PDF). A study on key raw materials and their flows “through the EU economy, as raw materials or as parts of basic materials, components or products” has been produced by BIO Intelligence Service for the European Commission, DG GROW (BIO by Deloitte (2015) Study on Data for a Raw Material System Analysis: Roadmap and Test of the Fully Operational MSA for Raw Materials. Prepared for the European Commission, DG GROW). It contains Sankey diagrams for 28 materials considered critical or important to European economy, such as cobalt, lithium, or tungsten. The flows of these materials into the EU-28 geographical area (imports) as well as out of the EU-28 (exports) are displayed for all substances in the same way. Recycling of the substance within Europe is represented as a loop, leading to a kind of see-saw-ish diagram. Additions to in-use (e.g. the substance being part of a product in use) and a certain amount of the substance being disposed off (e.g. as waste) are also shown as arrows to the right. Below is the diagram for cobalt. Flows are in tonnes for the year 2012 (t/y). All Sankey diagrams are color-coded the same-way, providing additional information whether the material (in the case above: cobalt) is imported as raw material or as part of a product, and whether it is exported as processed material, waste, or also as part of a product. 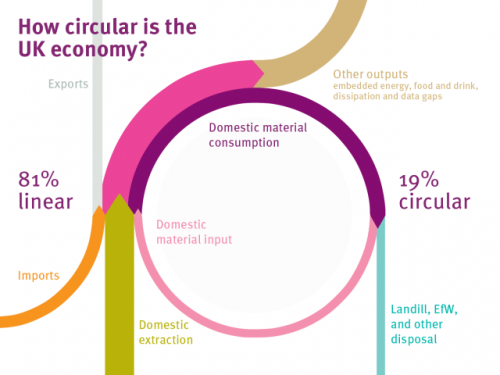 How Circular is the Global Economy? Here is another one from an article by Willi Haas et.al. published a few weeks ago (How Circular is the Global Economy? : An Assessment of Material Flows, Waste Production, and Recycling in the European Union and the World in 2005; DOI: 10.1111/jiec.12244). The answer to the question raised in the title is answered visually: Not very circular! Fossil fuels (yellow) are converted to energy, most biomass (green) ends up as gaseous emissions or solid waste. Construction materials are in orange and metals in blue and these add to stocks of buildings, infrastructures, and other goods with a lifetime longer than a year. The two red arrows are for industrial minerals and “waste rock” (would that be tailings from mining?). Note: The legend is cut off in the screengrab above (please check the original article, page 6). Interesting article, make sure you read it (open access). It also features a second similar Sankey diagram for Europe (EU-27). Beautiful and intelligent use of a Sankey diagram. Another wild like-to-be Sankey diagram. Found this on a resources and links list related to ‘material flow’ hosted at Hiroshima University. The diagram is from a white paper on a ‘Recycling Society’ published 2006 by the Japanese Environment Ministry (HTML version). Data is for the year Heisei 15 (=2003), the book was published in 2006. The title 平成15年度における我が国の循環資源フロー can be translated as ‘The resource flow cycle in Japan in 2003’ (any other suggestion from a native Japanese speaker out there?). Flows are in million tons (百万t) per year as indicated in the top right. Values in square brackets relate to the previous year (2002). Flows are not to scale and their width seems to be chosen almost deliberately. The diagram itself is a very interesting depiction of national material flows. 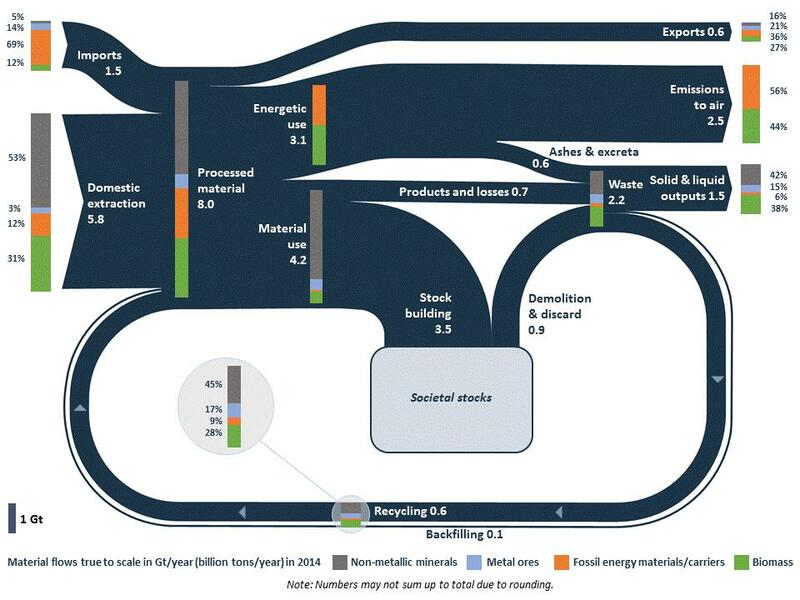 Starting out from the 582 million tons of material (green box lower left), a large portion (220 million tons) is recycled, either directly as rejects from production (96 million tons) or after product use (124 million tons). 3 million tons are reused. (1) Could this general diagram setup serve as a role model to visualize reuse and recycling in a country. What are the common standards in national MFA accounts for this? (3) What would be the picture for Japan in 2015 in comparison to 2003? Material Flow Analysis (MFA) looks at substances or materials, often with a regional or national scope. MFA also has a stronger emphasis on stocks and stock changes. From the MFA blog (see blogroll on the right) comes the below diagram on lead flows. The grey area delimits a region. Lead flow quantities are in tonnes per year. ‘Imports’ (to be understood as contamination or ingression here) to the region are from the left, ‘exports’ to the right. There is a net increase of lead ‘stocks’ in the region (accumulation in landfill). Flows are on the same scale only for smaller quantities. The two large flows would have to be drawn much wider if they were on the same scale. Instead they have an upper cut-off indicated by the labels “>240” and “>330”. Yesterday it became known that the European Commission would shelve their circular economy package of waste, recycling and incineration laws for now, in favour of an even more ambitious legislation to be presented by end-2015 (read here or here). The first one is by WRAP UK, showing the EU-27 material flows estimated in 2020. This is not for a specific type of material, but all material. Flows are in million tonnes, with the 2020 values in blue, and the current (2010) figures in brackets below for comparison. There are three nodes: ‘Direct Material Input’, ‘Domestic Material Consumption’ and ‘Waste’. Unfortunately the size of the node icons is too large, and the flows are difficult to see. But still, this is a nice idea! The main message is that in comparison to 2010, Europe could have 350 million tonnes of recycled material in 2020. Check out these Sankey diagrams by WRAP UK that basically convey the same messsage, but are less infographic. Another Sankey diagram I found when browsing through the tweets was this one below. The title of the diagram is “How circular is th UK?”. I found it in a blog post ‘Designing Out Waste Consortium’ by Ramon Arratia on Interface’s Cut The Fluff blog on sustainability, but it is originally from this Green Alliance blog post by Julie Hill. No values shown along the flows in this Sankey diagram, but neatly shaped circular flows. The question raised in the title is answered prominently with the message that 19% of the material in the UK is led in a loop (pink flow).